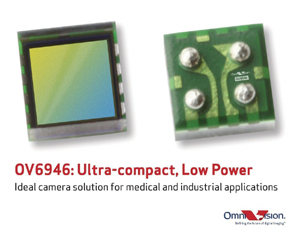 Santa Clara, Calif. -- OmniVision Technologies, Inc. introduced a new ultra-compact CameraChip sensor for medical and industrial applications. The 1/18-inch OV6946 captures 400 x 400 pixel resolution images and video with excellent color fidelity in a small 0.9- x 0.9-mm package that consumes low power. In addition, it offers a width of 1.65 mm and a height of 5 mm, which makes the device well suited for reusable endoscopes. Using an advanced 1.75-micron OmniBSI+ pixel, the OV6946 captures high quality 400 x 400 resolution images and video at 30 frames per second (FPS). In addition, the sensor's reduced pinout and basic ISP functionality offers extremely easy integration, said OmniVision. Availability: Available for sampling. Volume production is expected in the third quarter of 2015.